Chief Joseph was a native American tribal leader and orator. His name means "Thunder Going to the High Mountains." As chief of the Nez Percé tribe he is famous for defending the interests and fighting for the rights of his people. He has been described as a skilled tactician who was often able to overthrow larger American forces. The Nez Percé tribe occupied an immense area of land close to the Washington-Oregon border. In 1855 they agreed to sacrifice the land for a reservation in Oregon. When gold was discovered on the land in 1863 the tribe wanted the land back. In 1877, the failure of the American government to keep treaty obligations caused bloody battles between natives and soldiers. Joseph and his tribe attempted to retreat the 2400 kilometers from Oregon to Canada. They finally submitted to defeat forty-eight kilometers from the Canadian border. 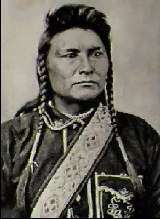 It was there, with his people badly beaten, that Chief Joseph gave his surrender speech, I Will Fight No More Forever. When the work was printed in the North American Review in April 1879 it served as an inspiration to all Native-Americans during desperate times. Soon after the tribe resettled in Idaho on the Lapwai Reserve and were later permitted to return to Oregon. A fictional account of Chief Joseph can be found in From Where the Sun Now Stands, written by Will Henry in 1960.